6:00 am @ Oak Bay High School driveway off Cadboro Bay Road across from Epworth Street (2121 Cadboro Bay Road). Roll out is no later than 6:05 am sharp. The A ride is a no holds barred, go as fast as you can general sufferfest. If you get dropped from this ride no one is going to slow down and wait for you. However, if someone gets a flat or a mechanical, the ride usually stops until the problem is solved. The B and C rides are “no-drop rides” (i.e. nobody will be left behind). 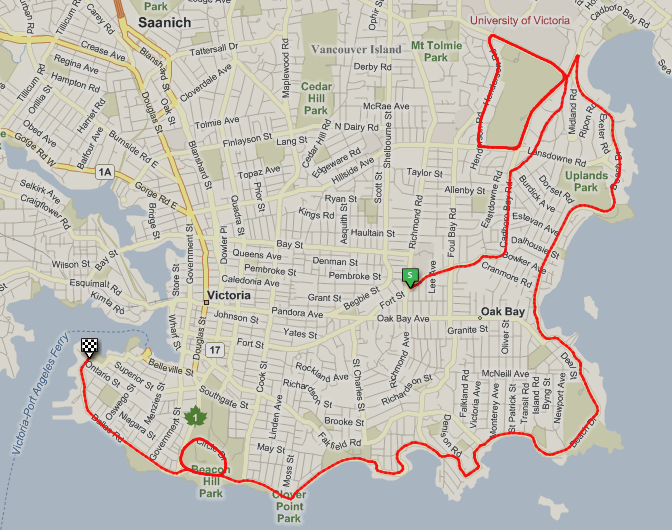 Route: thru Uplands/Terrace Rd then left on Cadboro Bay Road to ride the “Box”: South on Cadboro Bay Road, Right onto Landsdowne, Right onto Henderson, Right onto Cedar Hill X Road. Repeat four or five times depending on the group. There is a sprint on alternating laps, again depending on the group. C rides may not have a sprint. B rides may sprint on laps two and four, but that can vary and will be decided at the start of the ride by the group. A rides may sprint on laps 1, 3 and 5. The C-group will either ride the University Circle or the Box, usually in a pace-line keeping everyone together with a sprint on the last lap. The C ride is always at the pace of the slowest rider, making this a great ride for an introduction to group riding. Following the last lap of the Box, we go left on Cordova Bay road and hard right onto Beach Drive through the Uplands gates. Carry on along the waterfront to Beacon Hill Park where, depending on the group, several laps are completed with a sprint on the final lap. The A-group usually does 6 laps of Beacon at full speed, the B-group does 4 laps, and the C-group does 2 laps.